Philosophy has placed a lot of effort into proving that the corporeal is produced by the spiritual, that the soul begets the body. This is, of course, nothing more than philosophy’s invention. 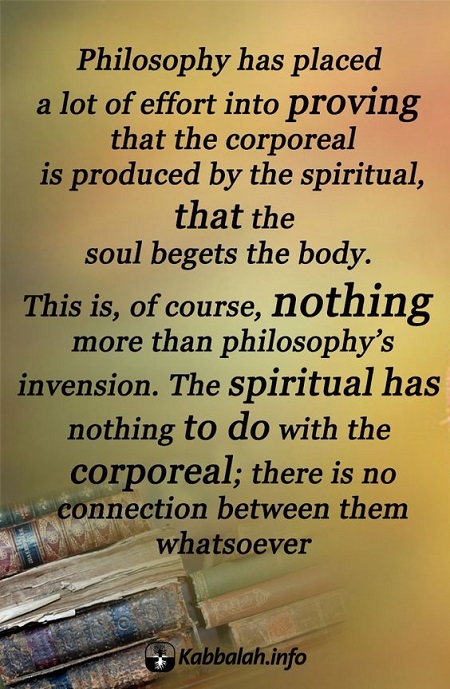 The spiritual has nothing to do with the corporeal; there is no connection between them whatsoever. It’s necessary to separate the two worlds. However, they aren’t separate in and of themselves, but only relative the person who attains them. Outside a person, there is only the general Light. Once a person attains the Upper World, through it he sees our world, and he is no longer confused about the origin of everything that happens and about the connections between all parts of the world. May 6, 2014 at 7:30 pm · Filed under Perception of Reality, Philosophy, What is Kabbalah? What Is Unique about the Wisdom of Kabbalah? Philosophy and any other of our attempts to understand reality are based not on research but solely on reason, which is really based on what is not known, as a rule, they are based on our egoism, but we do not realize it. As a result, philosophy died a long time ago. All so-called spiritual teachings are gradually vanishing, since people rise above them and see that they are invalid. There are no substantiations or verifications concerning the seriousness of multiple spiritual teachings. They’re exclusively based upon our sensations, but as we all know, feelings can be very diverse; that’s why presently there are about 2,800 religions and belief systems, and we see them gradually disappearing. Kabbalah is not for or against them. It stands aside them; it explores nature as physics or any other regular science does. The major principle of Kabbalah is investigating nature, becoming similar to it, and by doing so, succeeding. Kabbalah is a very concrete science; it does not discuss the soul in the way other religions do. 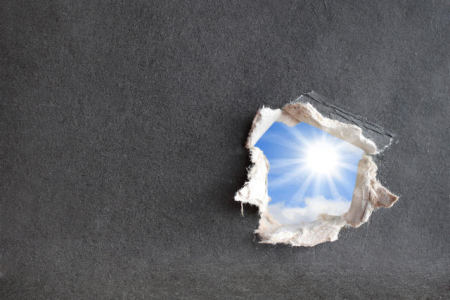 Today’s daily lesson featured Baal HaSulam’s article “The Wisdom of Kabbalah and Philosophy” with commentary by Rav Michael Laitman, PhD, and with an onslaught of questions by the students of Bnei Baruch. The lessons will be continuing daily at 10pm EST on Kabbalah TV, and will be available in the Kabbalah Media Archive.